H.E Yahya bin Said bin Abdullah al Jabri, Chairman of the Special Economic Zone Authority in Duqm (SEZAD) hailed the efforts made by the Sultanate to attract foreign investments and activate the role of private sector in the development process by providing them with world-class infrastructure and investor -friendly legislative framework. While addressing the gathering at the seminar organized by SEZAD in Rome yesterday ( Wednesday 24 Sep) , al Jabri pointed out that the Sultanate of Oman , under the wise leadership of His Majesty Sultan Qaboos bin Said, managed to make impressive achievement in all walks of life especially in merging the Omani economy with the world economy. It built world-class high quality infrastructure projects including roads, ports, airports, power and water plants, school as well as hospitals and health centers. It is currently implementing the national railway project which will connect all major cities and ports in the Sultanate. The railway project will also connect the Sultanate with the rest of the GCC countries. The Italian officials and businessmen as well as representatives of many Italian companies welcomed the promotional campaign organized by SEZAD in Rome and expressed their interest in setting up joint ventures in the future. 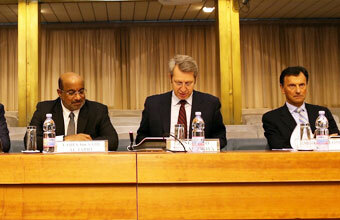 Al Jabri also pointed out that the Omani Italian relationship is growing in all fields. He added that the Sultanate is looking forward to develop theme relation further and take them to new heights and horizons especially after the creation of the Omani Italian Joint committee which comprises businessmen from both sides. The fourth meeting of the joint committee, which was held in Muscat in July 2013, was concluded with signing a joint Declaration that fosters the relation between the Sultanate and Italy. He praised the visit of Mario Monti, Ex Italian Prime Minister to the Sultanate where he expressed the keenness of the political leadership to enhance and deepen relations with the Sultanate in all fields. During the visit, Monti said that the Italian companies are interested in taking part in the major infrastructure projects in the Sultanate. During his presentation, al Jabri pointed out that Italy is one of the leading industrial powers in Europe with many competitive edges in manufacturing and industrial innovations. This means that the Italian industry has the ability to compete in the global markets and meets the needs of Oman\\'s conversion to the digital economy. \\'The noble feelings between the two sides will contribute to enhancing bilateral relation s and I am sure that this promotional campaign will foster the trade and investment links between the two countries, he added. While explaining the aims behind the establishment of SEZD, al Jabri said that the Sultanate has allocated 1745 square km of land to the zone to serve as a logistic hub and a gate not only to the Gulf region but also to MENA and South Asia. He added that the Omani government is keen on attracting more investments and generating considerable number of job opportunities. It also seeks to impart new technology, enhance the growth of the industrial sector and respond swiftly to the developments taking place at the market. He added that the Omani has built a number of high quality infrastructure projects such as roads, airports, power and water plants and multipurpose port with 18 m deep berth provided with Drydock. The move by the Sultanate government comes in a bid to create more business opportunities for upstream and downstream industries and to rehabilitate the Zone to become one of the best places where one can work and relax. He pointed out that the government will provide the oil refinery and the petrochemical industries complex with gas. It will also build fishing marine and a complex for fish industries. SEZAD chairman hoped that the promotional campaign would conclude with setting up new ventures with Italian businessmen and investors especially the campaign provided investors with both parties with an ideal opportunity to hold bilateral meetings and explore real investment opportunities in the Sultanate. The seminar included many presentations about investment opportunities in Duqm, the underway project, the planned projects, the investment environment in the Sultanate, the scores of incentives provided to investors and the potentials at Duqm Port, the dry dock and the tourism project. As part of the promotional campaign \\' Duqm Calls\\', bilateral meetings were held between representatives of the Italian companies and members of the Omani delegation during which they shed light on the investment opportunities in SEZAD.